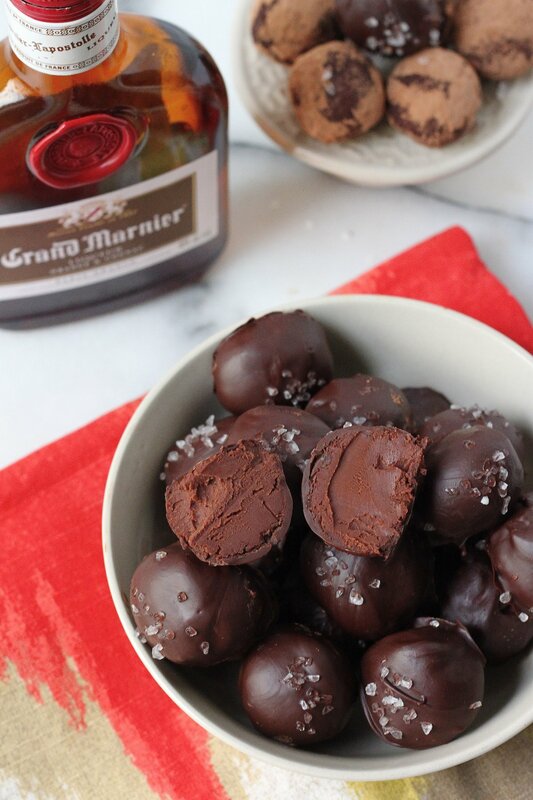 Today I’m super excited to share with you these simple Grand Marnier laced chocolate truffles. They’re pretty, decadent, and make great gifts for the chocolate lovers in your life. A good thing to keep in mind now that the holidays are a comin’! These truffles are SUPER rich, not too sweet, and topped with just a kiss of flaky sea salt. 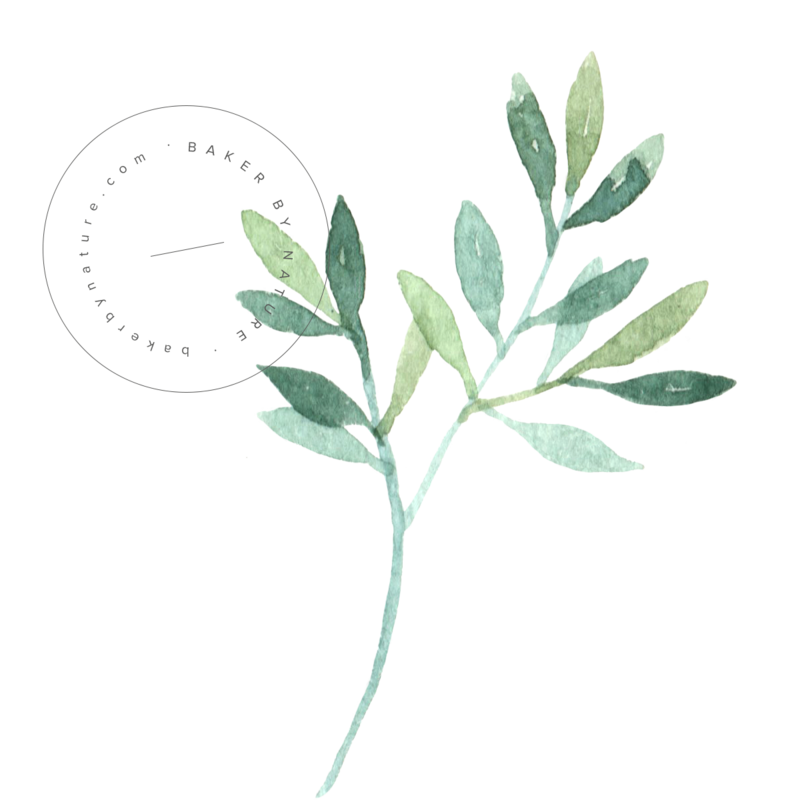 I love the way sea salt rounds out sweetness! And it looks pretty sprinkled on top of these dark little rounds of decadence. Chop the dark chocolate into very tiny pieces and place in a large heat proof bowl. Heat the heavy cream and butter in a small saucepan over medium heat until gently simmering. Remove from the heat and pour the mixture over the chopped chocolate ; stir well to combine, whisking until chocolate is completely melted. Gently stir in the grand marnier. Pour the mixture into a small glass baking dish and set in the refrigerator for at least 2 hours. 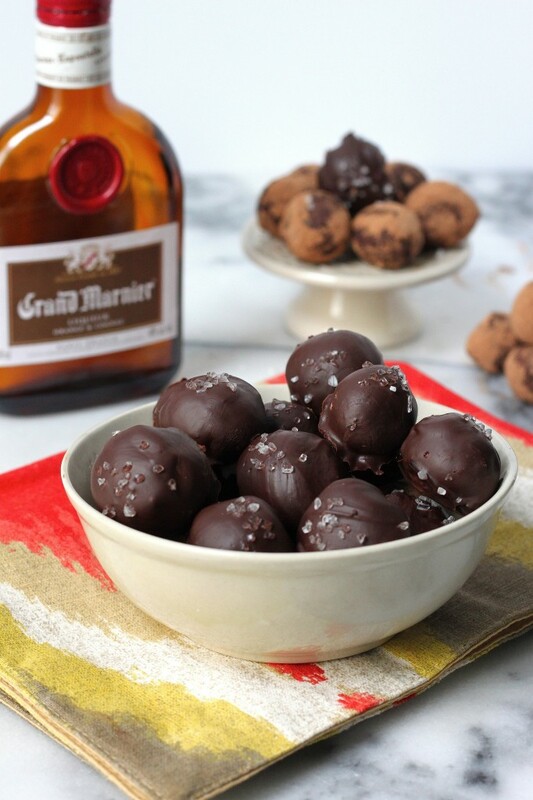 Using a melon baller, scoop small chocolate balls onto a parchment paper lined sheet pan lined and return to the pan back in the refrigerator for another 45 minutes. Place the cocoa powder on a large clean plate; set aside. While the chocolate is setting, combine the 5 ounces of semi-sweet chocolate and the oil into a microwaveable mixing bowl, and microwave for 15 seconds. Stir, and continue to heat on 15 second increments until the chocolate is completely melted and can be whisked smooth. Remove the truffles from the refrigerator, roll each one in the cocoa powder, and shape into balls by rolling between the palms of your hands. Add more cocoa powder if they get too sticky. Place truffles, 1 at time, on a small spoon or scoop and roll around in the melted chocolate until coated. Repeat until all truffles are coated. Place coated truffles back on the parchment paper lined baking sheet, and sprinkle with sea salt. Allow truffles to set in a cool dry place for at least 1 hour before serving, or store in an airtight container in the refrigerator. If storing in the refrigerator, bring to room temperature before serving. OMG, I made these and they are like little shots of chocolate with orange liquor, Absolutely delicious. These are for an event on Saturday. I mixed them up yesterday, I left in the bowl overnight in the refrigerator. Rolled them into little balls this morning and put them in freezer for 30 minutes. I then dipped them in chocolate and had no problems. I was thinking about doing this with Apple Crown. Think it would work? What if I added caramel to it too? OOH! How many does one batch make?? 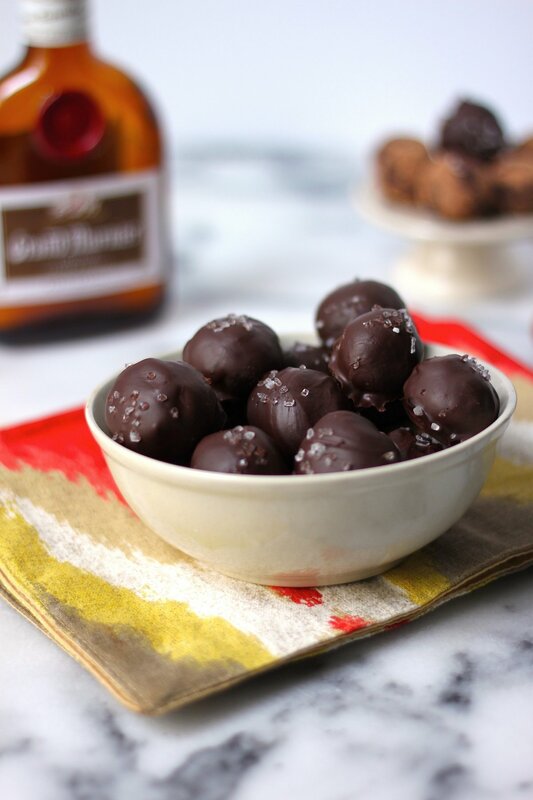 Booze in my truffles? Yessss ma’am! Homemade truffles rock! Love these boozy babies, Ashley! Pinning! A lovely recipe. Some info on Grand Marnjer: Grand .Marnier is a liquor made of the finest brandy and small bitter oranges (also used for perfumes, you can’t eat these type of oranges). Doing is not a cherry liquor as you think. If no Grand Marnier is available in your country you could replace it with Cointreau or another triplesec. 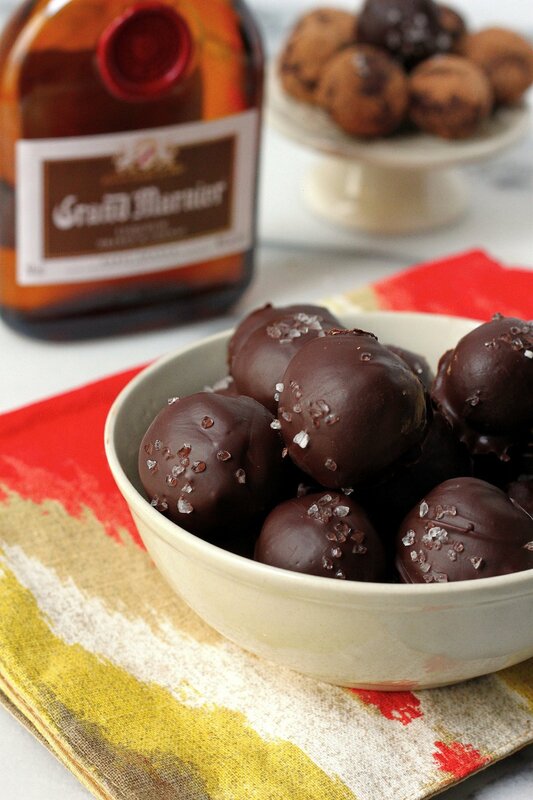 Couldn’t say no to these – chocolate and orange (let alone Grand Marnier) is one of my favorite combinations. Bliss! YUM! These look gorgeous. Orange and chocolate is one of my favourite combos. It doesn’t get much better than booze and chocolate! Looks delicious, Ashley! Love homemade truffles, especially at this time of year and especially when they have a splash of booze in there too! Truffles at home are the best! They somehow taste better, I think because of the love infusion. Yours are so pretty! I love chocolate orange. These look insanely rich and delicious!! Oh. My. Ashley, I can’t even articulate, in words, the sheer beauty of these truffles! Oh goodness, I haven’t even ate breakfast yet and now all I can think about is these truffles! These truffles would make for a great holiday present! I know what my girlfriends are getting this year. I’m going to make and then eat all of these! Hello, how many servings does this make? Thanks! I’ve put this on my Pinterest board so I never lose the recipe. Off to add a couple things to the grocery list. Hi there:) Wondering if the heavy cream could be switched out with coconut milk for a dairy free version? Thank you kindly! ehhhh I hope it’s unsweetened cocoa power…not like hot chocolate sweetened cocoa…I’m on that step now…serving these at a party later…I’ll be highly embarrassed if people start chocking and gagging and pointing at me!!! It is unsweetened, Lisa. How did they turn out? This recipe will yield at least 2 dozen, possibly more depending on how you size them. I made these and when I was coating the chocolate became thick…….I couldn’t get it to stick to the truffles……made a second batch……any advice? Hi Mary! Did you try reheating the chocolate for an extra few seconds? Chocolate will harden up after it’s been melted, so sometimes you just need to nuke it in the microwave for 20 seconds to re-melt. This looked wonderful, but I had an extremely hard time making them and just ended up frustrated and throwing my batch away. Everything was great until I got to the semi-sweet coating. It wasn’t thin enough and then would melt the truffle. I had my husband helping, and I like to think I’m an okay baker usually. If you had any special instructions/tools/etc. that would be helpful. I might have made them too small, but I’m not sure if that was my problem. Photos of the process would have been helpful too 🙂 Thanks! I’m so sorry you had a rough time making these truffles. I simply plopped the truffles in the coating and then scooped them out with a fork. It’s a little messy and mundane, but it does work. Also, I am making another truffle recipe soon, so I will keep in mind your suggestion of step-by-step photos. Is it possible to chill the truffle filling the freezer for less time? Hey Sally! I haven’t tried it myself, but I think it will work. Just keep an eye on it. If it totally freezes you’ll be left with a frozen mess 😉 You want it just firm enough to scoop. Hello! These look decadent!! I’m planning to make some to give away as holiday gifts.. Please could you suggest some good quality dark chocolates and where I could possibly buy them from. Can you make these with other liquors? Hi Carol. You could try! I have only made them with grand marnier, so I can’t say for sure. Hi Yvette. The consistency should be semi-firm, but not hard. I typically use a cookie scoop and roll the balls in my hands. It’s a slightly messy process, but it works. You can always firm the chocolate up in the freezer for a few minutes if need be. Happy holidays! Hi Jim! I’m so happy to hear these turned out well! Making a batch every year sounds like a wonderful tradition. Happy New Year! Looks delish! What is the yeild per batch approximately? Made these today and WOW! So rich and wonderful. I used Kahlua instead of Grand Marnier because that’s what I had on hand. Excellent. Can’t wait to share these! Hi Kelly! That’s awesome 🙂 The kahlua addition sounds so dreamy; I’ll have to try that soon. Thanks so much for letting me know how they turned out! Can these be made without the alcohol? 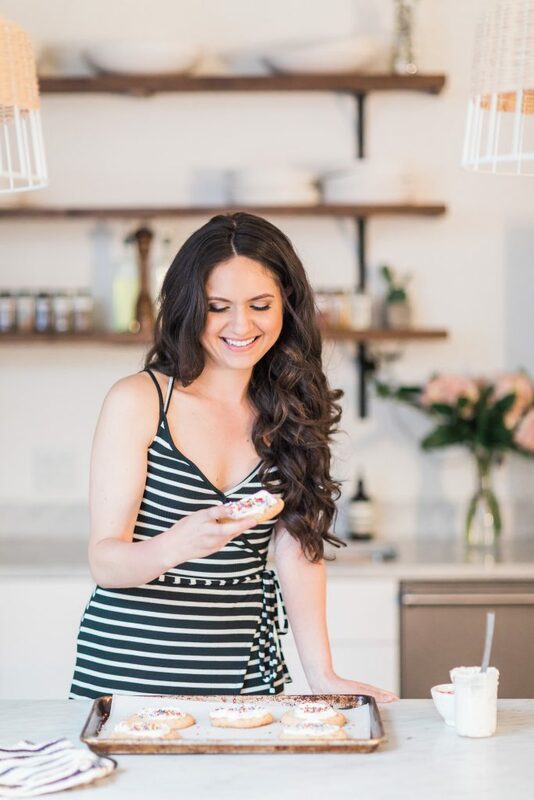 I want to make them for a shower but cannot use alcohol due to the pregos……what could I sub it for or need to do to the recipe? These look delicious, and I love the orange liquor twist! Would it be a problem to use bittersweet chocolate for both the truffle and the coating, instead of dark & semisweet? Thanks for your help! Hi Valerie. I think the truffles would be very intense with all bittersweet chocolate as there is not much sugar in the recipe. That said, if you know you enjoy very bitter desserts, I don’t see why you couldn’t use all bittersweet. Please let me know if you give it a try! Thanks for your reply! I ended up using bittersweet chocolate for the inside and dark chocolate for the coating – and they came out delicious! I left them in the freezer for the day after initially breaking up the ganache, and they were much easier to handle. I also added a bit of cinnamon to the cocoa powder and some rum to the dark chocolate. Thanks for the great recipe! Hi! I recently made these for thanksgiving. They were delicious and such a big hit, however, I really had a tough time getting the chocolate to stick to the truffles! I mixed everything according to the instructions and stuck the bowl into the fridge for 2 hours. But after 2 hours, the ganache was still too soft. So I stuck the bowl into the freezer for about 45 min or so. That seemed to do the trick. I rolled them in cocoa powder then put them back into the freezer. But when I dipped them in chocolate, they seemed to fall apart and make the chocolate all clumpy and unusable! Was I supposed to use a shallow dish for the ganache to sit in while chilling? How many does one recipe yield? I’d like to make this using Bourbon and the recipe looks so easy!!! Hi Deborah. This recipe yields about 16 truffles. Enjoy! Can you freeze these truffles ahead of the Christmas rush? How many truffles does each batch make approx? Can these be made without the liquor? My little ones love truffles. Just use a few drops of orange extract instead of the liquor. About how many truffles does this make? About how many truffles does this recipe make? I think I found my contribution to Christmas dinner! 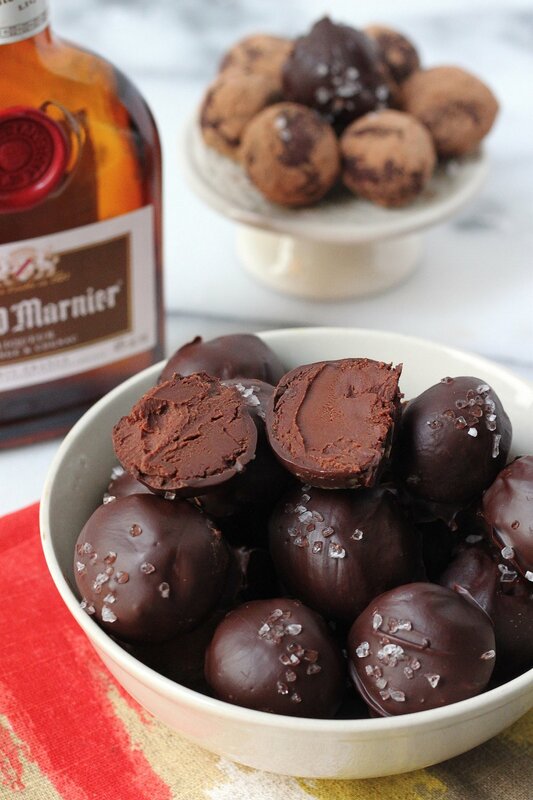 Have you ever tried using Creme de Menthe liquor with these istead of Grand Marnier? If so, how much would you add just to add a hint of mint flavor? Made them tonight. Very good. I added orange extract to both chocolate parts.